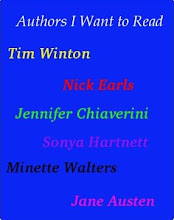 From Goodreads: Meet the Cooke family. Our narrator is Rosemary Cooke. As a child, she never stopped talking; as a young woman, she has wrapped herself in silence: the silence of intentional forgetting, of protective cover. Something happened, something so awful she has buried it in the recesses of her mind. Thoughts: This is our book group read for January. Apart from the fact that I could never remember the title when people asked me what I was reading, I quite enjoyed it. It's going to be one of those hard books to review, because you don't want to give anything away. One of the first things I noticed was how crystal clear Rosemary's voice was in my head. I could see her, hear her. I know how she stands, what gestures she makes, her facial expressions - I'm in real trouble if they make a movie! I'm incredibly grateful I read this on my Kindle as Fowler often uses words that I needed to look up. I'm still unsure if this is a good or bad thing. When I read hard copy books, if I came across an unknown word I'd just keep going and hope I'd get at least the general idea from the text around it. As any teacher will tell you, this is not only a valid but an important reading strategy. Being able to understand an unknown word from the words around it is a vital skill. Hopefully it's not one that disappears completely with the advent of technology in classrooms and society. I made judgements about the author early on in the book that I then had to change. Early on you are aware that Rosemary's sister Fern has disappeared. You're not sure what has happened, but Rosemary goes to her grandparents for a couple of days and when she comes back Fern is gone. At first Rosemary believes she is the one who has been given away, that Fern has been chosen over her. When she discovers that Fern is the one who is gone she of course is instantly relieved and guilty at the same time. She makes the statement that "In most families there is a favourite child. Parents deny it...but it's obvious to the children." It's a statement that annoys the hell out of me. As one of three children I never truly felt one of us was favoured over the other. Talk to my sisters and they will tell you the same. I have two kids, I love them equally. I love my sons adventurous nature and his cheekiness. I love my daughters infectious giggle and natural curiosity. I love both their affectionate natures. I see different strengths in each of them, but I love them the same. Further on in the book though you can start to see why Rosemary felt this way. In a way this is a book that trades on it's secret. It uses it to draw you in. However, I think even if you know the secret before the start of the book it's worth reading. It's an important part of the story, but not the whole story. If you belong to a book group, I highly recommend it. I know I'm looking forward to discussing it on Sunday. 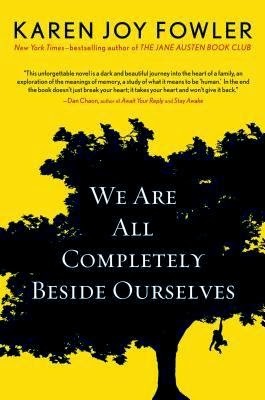 We Are All Completely Beside Ourselves gets 4 stars.